NB: On the Kon Tiki they drank a ‘shandy’ (for two months) of 40% seawater 60% fresh water with NO ill effects. As soon as you realise there is a shortage of water, add your own urine to your fresh water supply to extend it. Boil and distil it if you wish. Those who opt for stoveless hiking may one day thirst to death. 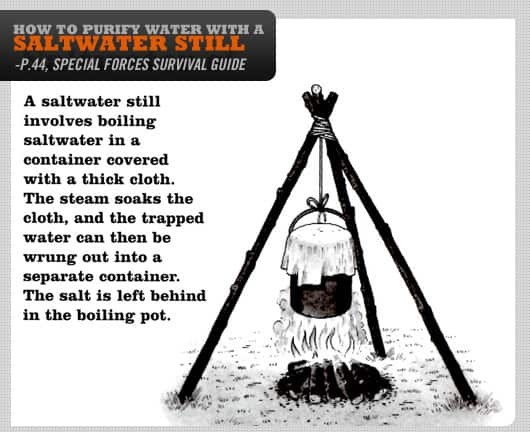 If you have a lighter, a billy and any garment, (but a hiking towel may work best) you can use the second (simplest) method pictured to DISTIL pure water from even the most brackish (or alkaline). As you can shandy sea water, you only need to distil 600 mls to have a litre to drink. Two litres per day will keep you alive indefinitely if you avoid excessive heat, and breathe outwards only through your NOSE (the Fremen were right!) 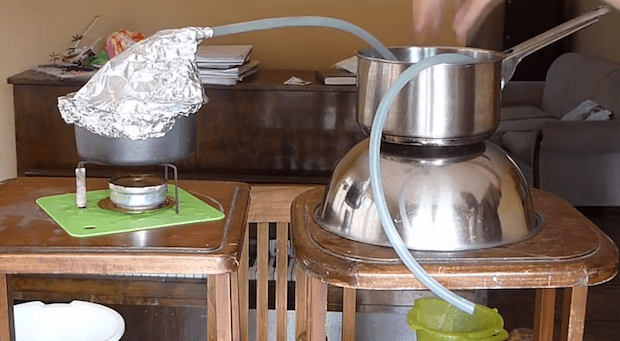 You only need enough fuel to boil away 1200 mls of water per day. Everyone will have seen the first method above, but it may be slow work for scant reward. You COULD use your cuben fibre tent if you didn’t happen to have any plastic sheeting handy. Your raincoat would also work, and wouldn’t be needed for its normal purpose in the circumstance. BOILING will get you a drink much faster I’m sure. 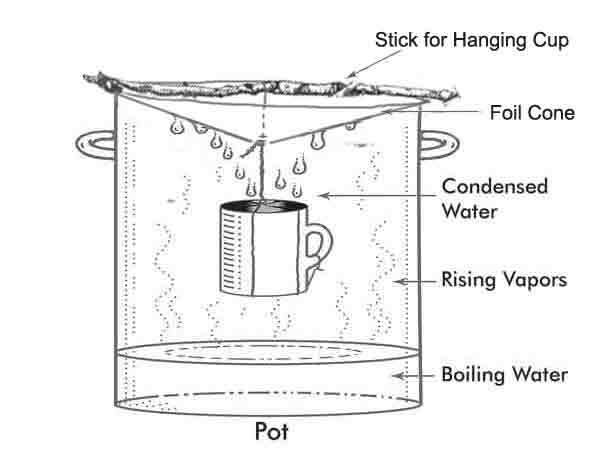 If you have a length of hose (eg from a drinking tube), you could direct the steam from Method 4 into the solar still, Method 1. NB: You do not need water for a still to work: there is always water in SOIL, no matter how dry (dig down a bit and it WILL be damper). Heating it in a billy will drive it out, as above. A titanium billy is a better survival tool for this purpose than a tin one (the solder can melt) or an aluminium one (which will burn away more readily).